We have a wide selection of beef, pork, chicken and seafood. Our meat is fresh and our prices are great. 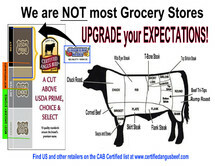 We offer Hormel Natural Choice, Smart Chicken, Certified Angus Beef, and our brand new Meat Bundles. Click on the links to discover more about these choices. Stop by today to explore our meat selection and talk with Andrew, Josh, Kelli and Harold.